Dignitaries stand while the grounds for the new Student Services Building are blessed. 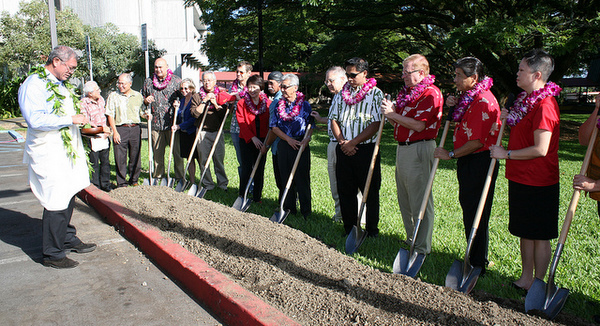 A blessing and groundbreaking for the University of Hawaiʻi at Hilo new Student Services Center was held today at the project site fronting the Performing Arts Center. 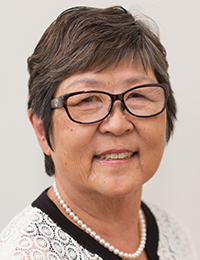 The 35,000 square-foot, three-story structure will provide a one-stop shop to complete all the activities needed to become a full-fledged student at UH Hilo and complete registration for classes under one roof. The Center will also house all of the programs that students need to support their college success: Admissions Office; Office of the Registrar; Financial Aid Services; and the Cashier’s Office will be located on the first floor. The Advising Center, Career Development Services, Disability Services, Counseling Services, the Women’s Center and the new Health Promotion Program will be located on the second floor while the Offices of the Vice Chancellor for Student Affairs and Dean of Students and other student support staff will be located on the third floor. Dr. Luoluo Hong, vice chancellor for student affairs, says the Center represents a giant, positive step forward in changing the way the University meets students’ needs. Dr. Debra Fitzsimons, vice chancellor for administrative affairs, sees the Student Services Center as another element of innovation that is becoming common-place among universities. Despite numerous requests and limited resources, House Higher Education Committee Chair Jerry Chang said there was broad-based support for the project. The $15.9 million building was designed by Urban Works, Inc. of Honolulu and will be built by Jacobsen Construction of Salt Lake City, Utah. The building is tentatively scheduled to open in 2012. It will replace the existing Student Services Building, which will become the new home of the College of Business and Economics.